It's one of those days when the news cycle is moving faster than I can write about it. 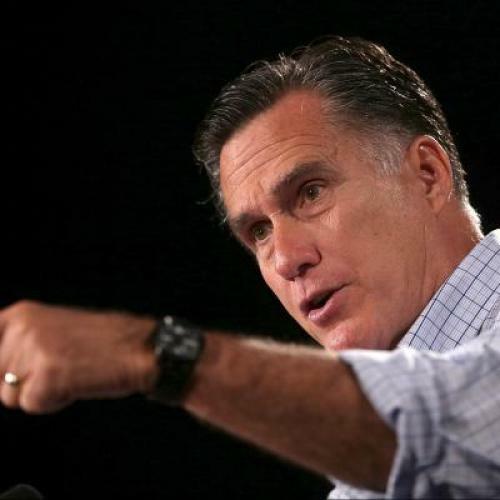 As of Wednesday afternoon, the chatter online is all about the Romney campaign's unexpected decision to cite his Massachusetts health reforms as proof that he cares about average Americans facing financial hardship. The decision is unexpected because Romney has spent the past two years vowing to repeal the Affordable Care Act, whose scheme for expanding insurance coverage is basically a national version of what Romney did in Massachusetts. Romney's rhetoric on Wednesday has reinforced the doubts of conservatives who think Romney doesn't genuinely share their views, on health care or government activism generally. If you want to catch up on this saga and what it means for the campaign, Philip Klein, Greg Sargent, and Benjy Sarlin have the goods. Or just move up one item on the Plank and see what Noam has to say. For now, though, let's return to the controversial ad that started this whole discussion, because it happens to frame the policy choices in this election almost perfectly—even if it does so in a less-than-perfect way. On MSNBC’s "Morning Joe," Mark Halperin said “this is about as low as either side has gone” while host Joe Scarborough called it “outrageous.” Even the Huffington Post’s Sam Stein, hardly a Romney apologist, thought the ad went over the line. Based on the available information—sorry, I haven't had time to do independent reporting—Priorities USA deserves at least a little grief. But I also think the reaction of Halpern and Scarborough goes way too far. An unproven allegation is not the same as a disproven allegation. And stories like this really do happen. When older workers lose their jobs, they frequently end up in jobs with lower salary and benefits, leading to a downward financial spiral that can last for years. When people have no health insurance, they frequently react by delaying medical care. The Institute of Medicine famously concluded that 18,000 people a year die prematurely because they didn't have health insurance. That estimate may be too high, but there's plenty of evidence some lower number is accurate—and that many, many more suffer financially, physically, or both. These facts matter, perhaps more than the specifics of Soptic's story, because the fate of the under- and uninsured is a central issue in this campaign. President Obama’s position is that the federal government has an obligation to make sure every American has health insurance, regardless of age, pre-existing condition, or employment status. That’s why he signed the Affordable Care Act, which puts in place a coverage system that will go a long way towards accomplishing that goal. Romney, of course, wants to repeal the Affordable Care Act. He also wants to change Medicare and Medicaid so that they provide less financial protection, while introducing tax changes that would likely weaken employer-sponsored insurance. The specifics of Soptic's story remain ambiguous. The consequences of Romney's policy choices do not. Does talking about those consequences make some people uncomfortable? I can only hope so.